The best way to get to know a community is by scheduling a tour. See the facilities, meet the staff and residents, and get a feel first hand what it's like to live at Mill Ridge Village Assisted Living. Tucked away in the tree-filled community of Milton, just a short drive from the cities of Tacoma, Federal Way and Puyallup, Mill Ridge Village offers retirees the freedom of an active, independent lifestyle without the hassles of home maintenance. Our residential retirement community provides both independent and assisted living to accommodate a variety of personal service needs. Mill Ridge Village is a Village Concepts Retirement Community. 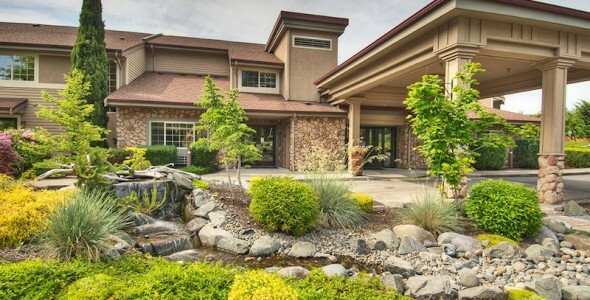 For more than 40 years, the family-owned and operated Village Concepts has been providing personalized retirement living to seniors throughout the Puget Sound and Central Washington. Accommodations are available in a selection of six floor plans to suit a variety of lifestyle needs. Choose from studio, one- and two-bedroom apartment floor plans which feature wall-to-wall carpeting, full kitchens and safety-bar enabled bathrooms. All of our private residences also welcome small pets. To help our residents stay active and engaged, we schedule a number of fun community events and activities ranging from resident vocal and bell choirs, happy hours, book clubs and weekly walking clubs. We also organize regular day trips to local destinations through our Adventure Concepts travel program. For the convenience of our residents, Mill Ridge Village provides home and grounds maintenance, a shuttle bus for local transportation, on-site beauty services, foot care services and even complimentary resident parking. All utilities, except for phone service, are included in the monthly rental fee as are three meals per day served in our community dining room. For seniors whose needs change over time, we provide the support and security of assisted living services right on site. Our caring and professional staff are available 24 hours a day to offer assistance with daily living activities such as bathing, dressing, mobility and managing medications. Enjoy some of the finest senior living in the Puget Sound area at Mill Ridge Village, where we bring retirement to life!